Research is the primary condition for durable development of any system using scientific methods. An American sociologist Earl Robert Babbie says, ‘Research is a systematic inquiry to describe, explain, predict and control the observed phenomenon’. In the same way, Research centre is the specific area dedicated to conducting specific research or educational activities. 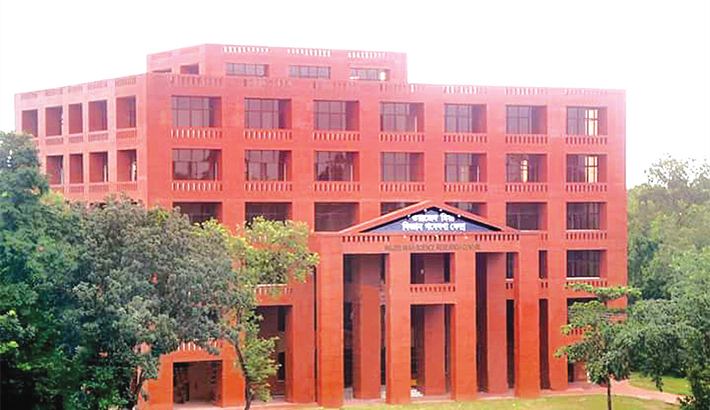 Jahangirnagar University has also a research centre named after eminent Bangladeshi nuclear scientist M A Wazed Miah. Wazed Miah Science Research Centre is one of the largest science research centres in our subcontinent. It was incepted on May 30, 2009, under the Higher Education Quality Enhancement Project (HEQEP). The mesmerizing six-story red-brick edifice has different types of research facilities for Physical and Biological disciplines. The research centre is chocked up with different types of modern and ultra-modern research equipment including Single Crystal X-ray detector, Powder X-ray detector, X-ray diffraction machine, NMR machine, HPLC, GC, Elemental Analyzer etc. which are applied in different research sectors like carbon dating method to determine the lifetime of any substance, analysis, and synthesis. DNA barcoding of any species, formulation of chemical products and other different types of research works which are conducted here too. X-ray diffraction (XRD) machine is one of the most important non-destructive tools to analyse the structure of all kinds of compounds ranging from fluids to powders and crystals. Research to production and engineering aspects, XRD is an indispensable method for materials characterisation and quality control. NMR machine is another important tool for determining the structure of the molecule. The Nuclear Magnetic Resonance (NMR) machine is widely used in analytical chemistry for checking purity and determining mixtures of compounds. Using this tool, the physical properties of any molecule, phase changes, solubility, and diffusion can be obtained. The research centre has 400 MHz NMR machine. High-Performance Liquid Chromatography (HPLC) and Gas Chromatography (GC) machines are used to separate the constituents from the mixture. These tools are widely used in analytical chemistry too. Elemental Analyzer machine is used in organic compound elucidation. It helps to determine the given compound easily. Infrared, Ultraviolet-Visible, and Fluorescence machines are used to determine the functional group of the compound and other distinguishable properties to elucidate the structure of the desired compound. “Students of the chemistry and chemistry related departments enjoy most of the offered facilities but it is particularly designed for different research areas. Prior to inception of the research centre some analysis would take few days for completion due to using manual methods but we can complete the same task just within a few minutes using the digital machines”, said Plabon Tarique, a master’s student of chemistry department who uses the research centre and works on extracts of natural products. Except for chemistry research facilities, a DNA (deoxyribonucleic acid) barcoding laboratory was established here for life sciences researchers. This is the maiden DNA barcoding research lab in Bangladesh. The researchers of Zoology department of the university around 300 species have already been barcoded in this laboratory successfully. In the research centre a computational chemistry laboratory was established also for both physical and life sciences researchers. Computational Chemistry helps to simulate any molecule easily. It is widely being used in the developed country. A Water research centre is also established to ensure safe water for all because peoples are suffering from waterborne diseases nowadays and day by day it is getting a common phenomenon around the globe. ‘Nano Technology’ has become a bizarre world in the science sector all over the world. Scientists are pursuing Nano Technology for its multi-dimensional facilities. It occupies tiny place but gives the output in large scale. Considering the importance of nanomaterials, Wazed Miah Science Research Centre was provided with a nanomaterial synthesis laboratory for nanomaterial science research. A Distance learning theatre was set up for making easier communication through visualization. It has also a conference room for holding important meetings. A total of 3 scientific officers are working in the research centre who are well qualified in operating the modern research tools. They have also a good number of research publications in different international journals. The scientific officers assist to operate the instruments in proper ways for conducting specific research. Researchers from different universities including Dhaka University, Shahjalal University of Science And Technology, Rajshahi University, Hajee Mohammad Danesh Science and Technology University etc. are taking the facilities from the science research centre. Dr. Md Khabir Uddin, the director of Wazed Miah Science Research Centre, informed that they are experiencing acute manpower deficit as well as budget deficit for making the research centre well equipped. The foreign researchers are not showing enough interest to come here due to lack of budgetary allocations and accommodation problem. “Despite having a mentionable number of potentialities, we are yet to complete the research centre according to our planning but we are trying our level best to upgrade it to higher standard research platform”, he added. He is also thinking of upgrading the research centre to the international level so that a good number of indigenous and foreign researchers can conduct their researches here using modern technology.